The Cryonics Institute uses both a Portable Ice Bath (PIB) and an Active Compression DeCompression (ACDC) Michigan Instruments Heart-Lung Machine (Thumper). The PIB was fabricated by the Florida cryonics support organization S-A and the ACDC Thumper was fabricated by Michigan Instruments according to the design specifications of S-A. Both were purchased by CI from S-A. The PIB is truly portable, folding into what amounts to a small table for carrying by hand as well as in a vehicle. It takes about a half-hour to assemble and comes with a vinyl liner and cover, which are sturdy and water-proof. Although cooling a cryonics patient is often done with ice-packs, cooling with ice-water is faster than cooling with ice-packs because of the high thermal conductivity of the water -- which can carry heat away by conduction as well as convection. Water baths are messy, but when it is possible to use them they are an added benefit to patient care. 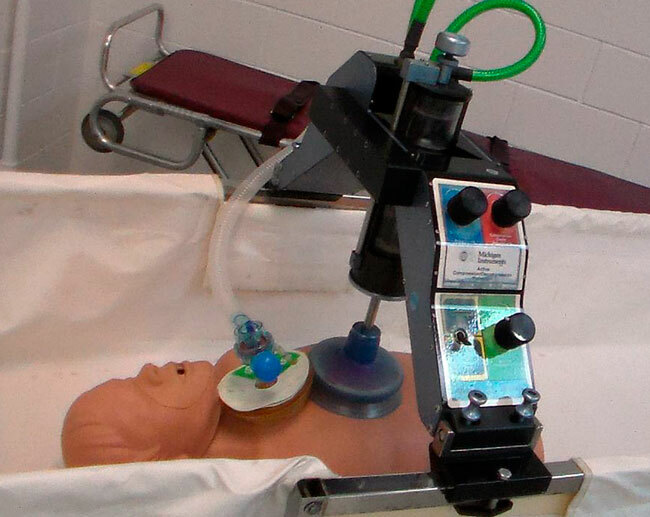 The ACDC Thumper is a top-of-the-line instrument for giving cardiopulmonary support to a cryonics patient. Whereas ordinary Thumpers only induce heart pumping action by compression, an ACDC unit can also use decompression to lift the chest with the suction grip of a rubber cup (like a toilet plunger, "plumber's helper"). ACDC Thumpers have not been approved by the US Food and Drug Administration (FDA) and therefore cannot be used on those who have not been legally pronounced dead. But there is no law restricting their use on cryonics patients. Our ACDC Thumper contains the words "WARNING: NOT FOR CLINICAL USE" in bold letters. The ACDC Thumper is driven by the pressure of an oxygen tank, and therefore is quite mobile. The Thumper can deliver steady compressions and decompressions or -- more likely -- can deliver five cycles of ACDC action with one cycle of oxygen ventilation through an air mask. Knobs on the ACDC Thumper allow for control of the force of compression, the force of decompression and the volume of oxygen delivered during a ventilation. The most likely use of this equipment would be for CI Members living in the Michigan area or for CI Members who have come to Michigan for hospice or hospital care prior to an anticipated deanimation. We have some manually-operated ACDC units -- Ambu-CardioPumps, thanks to Paul Michaels who was able to get them imported from Europe -- which we purchase for those living outside of Michigan who might want to use them.